This all started from a 4ch Wing Dragon. 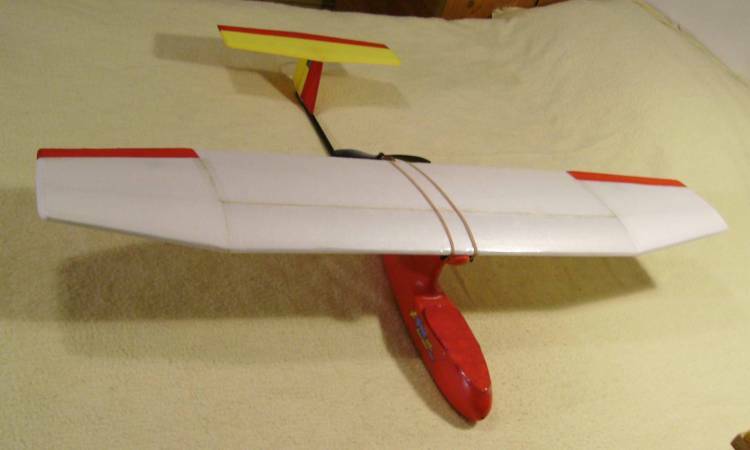 It flew well enough but obviously it could be improved by a brushless/LiPo conversion and eventually with a significant reduction in weight resulting from new wing and tailplane built up from 3mm Depron and a complete redesign of the servo layout. The result gave a most un-Wing Dragon like performance along with quite a substantial cruise duration. This set me thinking - just how long would be possible? I decided to keep to basic Wing Dragon layout & dimensions (40" span) but with everything as light as possible to allow for the maximum possible battery weight. After a long period of testing and development this is the final version. 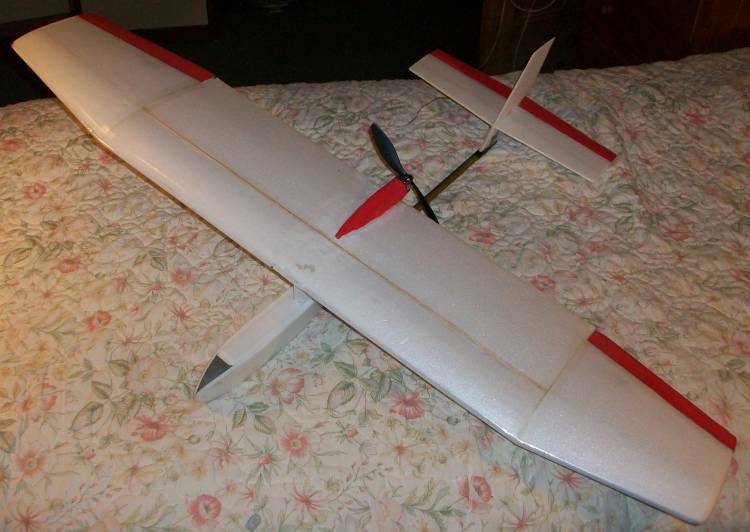 It has 3 micro 3.7g servos in a 'bank & yank' (no rudder) layout and a 1800kV Blue Wonder out runner driving a 7x6 prop. Made almost entirely from 3mm Depron it weighs just 7oz ready to go less the battery. The battery itself is a 5000mAh 2s job weighing in at 7.4oz and fills the entire nose section. A ground run showed the motor could run for close to 30 minutes at full power (9.5A) and at this power level it was capable of modest (roll & loop) aerobatics. The real question however was just how little power could it fly with. This morning I launched at 9:56am and landed at 12:01pm, a flight duration of 2hours 5minutes. From a flat site with the motor running continuously, in still misty conditions with absolutely no 'lift'. Not the most exciting form of flying and it leaves you with a stiff neck but it does show what can be done with a humble foam pusher! Awesome Job. That is really cool. This is just the plane I've been looking for, would you be willing to draw out some plans for this plane. I know that I would enjoy plans, and I think that carbon might be interested in a slightly bigger version too. I think that carbon might be interested in a slightly bigger version too. That's true, I guess I was thinking of one of the super light FPV systems. oh well, I still think that would be long enough for my purposes. Carbon and I have slightly different Ideas for FPV search and rescue. Mine doesn't need a 3 hour cruise, as it is launched from a forward ground team. It also would carry a ELT beacon, the FPV would only be for general guidance, so this would be a pretty good design for me, maybe not Carbon so much. That is a very nice looking plane and the performance is pretty cool, too. change batteries all the time. at 5V, so that you don't run out of keychain batteries. Unfortunately I have no plans for this plane, any cutting lines I required were drawn on the Depron itself, however I can quite easily put all the major dimensions on a sketch if that would help. The wing section is a standard 11.7% Clark Y. Its span was arbitrarily set at 40" (to match that of the Wing Dragon) and the chord calculated to give exactly the same area as the originals 'plank' wing. Indeed the wing was originally tested on my much modified Wing Dragon. I do have some pictures taken during the wing construction. The Endurance fuselage was built around and only holds the battery. 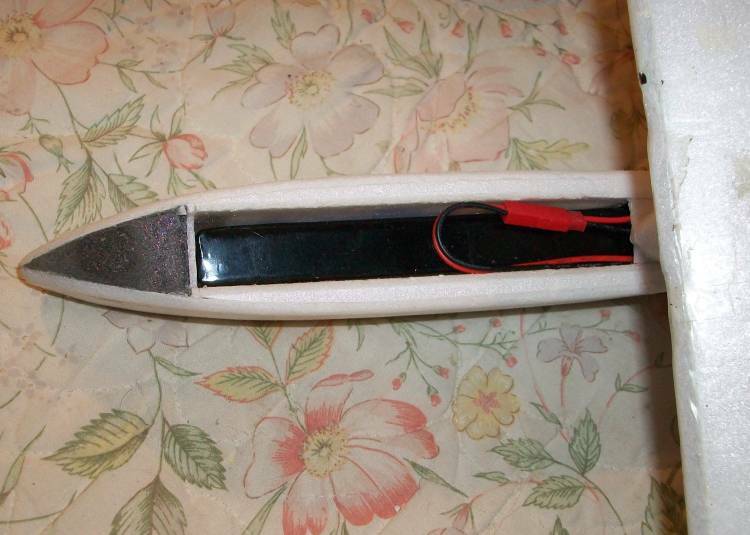 Both the radio and ESC are in the wing pylon and the elevator servo is built into the base of the fin. The Blue Wonder motor was selected not because of its power but because it had shown to be particularly efficient at the low cruising power levels expected. 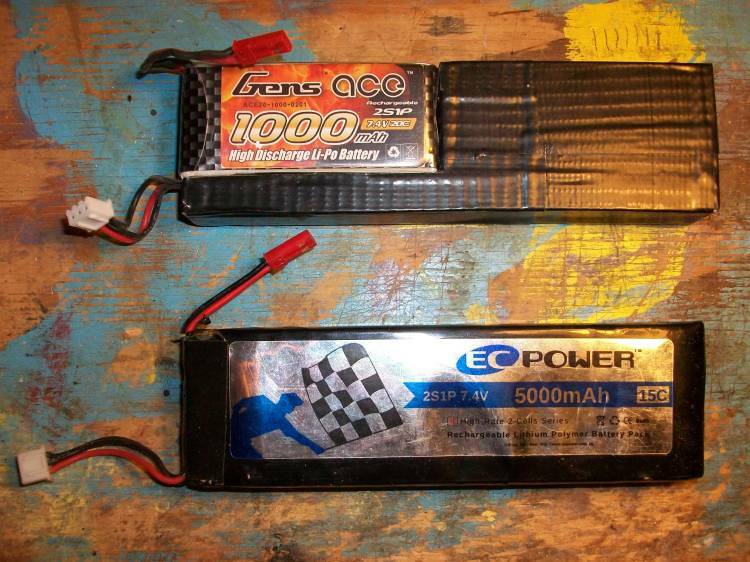 Even the use of a 2s LiPo rather than an equivalent capacity 3s with a lower kV motor was to reduce the electrical losses incurred by the BEC. As you can imagine all this makes the 'Endurance' a rather specialised design intended for a single purpose - endurance! And finally, a plane carrying more than its own weight in batteries, whilst sufficiently strong for flight, is never going to be particularly crash resistant and I can assure you it isn't! 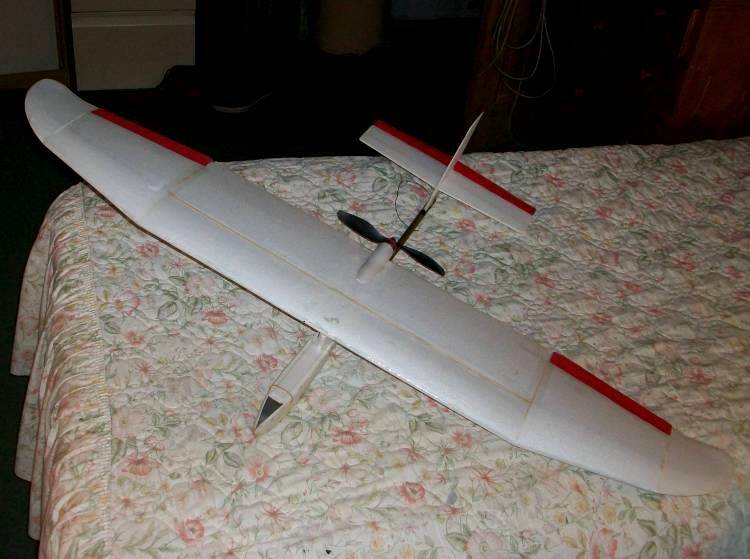 Having achieved 2 hours I suppose the question is - what improvements could be made to get it to fly for longer still? The area most likely for improvement would the prop. It is unlikely that the slow fly prop I chose is the most efficient possible, especially at the very low powers levels (< 20W) being used. The next obvious would be the wing and its section, however it is extremely light already and further weight savings would be marginal. It currently uses an 11% Clark Y section chosen as it is simple to build accurately on a flat board. In addition there is some evidence that at this size and low speed (i.e. low Reynolds number) the streamline profile and thickness to chord ratio are the dominant factors in the wings lift to drag performance rather than the detail of its exact profile. 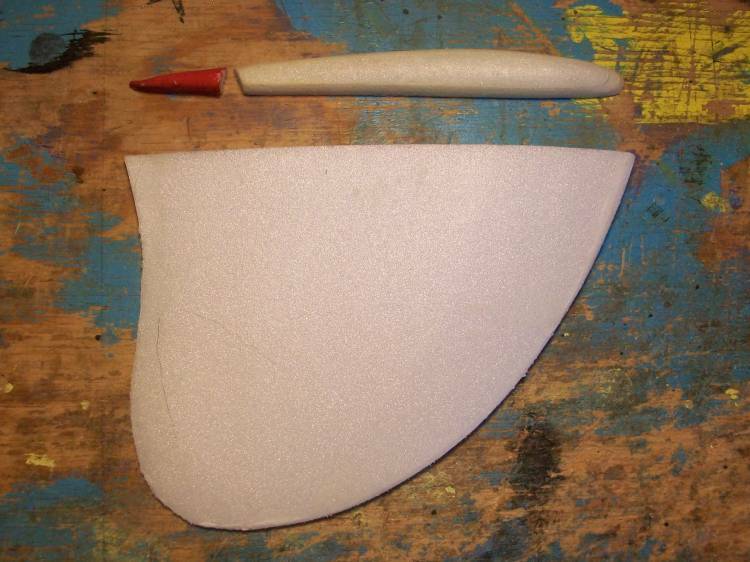 The wing tip profile is another area. For simplicity it has a simple square cut tip with a small fairing, however 'raked' and up swept tips are currently very popular that in theory at least can reduce the losses from the wing tip vortex. It would relatively simple to add new tips tip the existing wing. However undertaking a whole series of 2+ hour flights to identify any improvement is not really practical so the obvious route is to use a much smaller battery but with the appropriate ballast. The same size, weight and weight distribution (it contains 5oz of lead!) but only 1/5 the capacity. It should give about 25 minutes duration in the current airframe. If by aerodynamic improvements I can get this up towards 36 minutes then a full 3 hours should be possible with the 5000mAh version. Nevertheless this testing could still take some time as calm 'no lift' days do not occur that often! This morning I flew the endurance with the ballast battery right down to the LVC. The result was not what I had expected - it flew for 36 minutes! This suggests that with the 5000mAh battery its absolute endurance is over 3 hours. And that's before any of the aerodynamic improvements I have in mind. The first change is to replace the 8x3.8 prop with a coarser pitch 8x4.3 as this should be slightly more efficient at the very low cruise power setting. The question is whether any benefit will be actually measurable given all the other external variables that can effect a flight approaching 40 minutes not least of which would be the inevitable battery degradation resulting from running it down to the LVC on every flight. The other mod I had in mind is to the wing tips. The Endurance currently has square cut tips with a small fairing. Current thinking seems to favour raked and up swept tips that should, in theory at least, reduce the wing vortex losses. The current fairing and a 'raked' wing tip alternative. Each new 2mm Depron tip adds 4" to the span and only weighs 3g but that is still 7 times the current fairing! It is all going to come down to weight against drag reduction. The Endurance with its raked extended tips added that take the span out to 48". So apart from any benefit from the wing tip shape itself there is also a slight increase is the aspect ratio and a corresponding decrease in the wing loading. It certainly had some effect. With the 1000mAh ballast battery on board I launched today in cold calm conditions at 8:52 and landed at 9:53! Using the full 5000mAh battery it could potentially fly for not 4 but 5 hours. Unless the 1000mAh battery is considerably under rated (unlikely) flying for 1 hour means 1A and that's just 7.5W on a 2s. As the Endurance only weighs 14.5oz that's just 8.3W/lb and the radio and servos take some of that! Low power flying in the extreme! This is astonishing. Just absolutely astonishing. Yes it certainly feels strange launching a plane with just a 1000mAh 2s (and some 5oz of lead) yet landing an hour later! It is not particularly 'nice' to fly with limited stability in all axis so it does require quite a bit of stick input which must increase the servo load. When you are only using a total of 1A to start with servo load becomes significant. I plan to try with a 'gyro' on board to see if that reduces the net servo inputs but of coarse it will draw a current itself. I imagine that a gyro will probably shorten the time it stays in the air. Two reasons, and I will admit that they are mostly guesses. First, you have to power the gyro. Sure, they don't use much power, but still, the number is not zero. Second, they will be making constant, tiny adjustments. Like you said, servo load is significant, and the gyros will keep them loaded for most of the flight. Still, figure out how to make this a kit. I wanna play with it. At the moment with an hours endurance it is carrying just over 5oz of lead but there is not much room inside for any equipment. Carrying any more would be asking a lot as the battery + lead is already heavier than the whole of the rest of the plane. It has marginal stability in all axis so I don't think it would make a particularly good FPV vehicle and for maximum endurance it has to fly very close to the stall. Any turbulence and it is all over the place! At full power it is easier to fly but then the duration comes down to just 7 or 8 minutes!